Handheld virtual pet with more characters, new games, and secret codes. Play eight different games to earn Gotchi points to shop for gifts, food, and more. Create list of up to fifty friends. Infrared technology allows information exchange between devices. Plastic egg-shaped case on keychain. 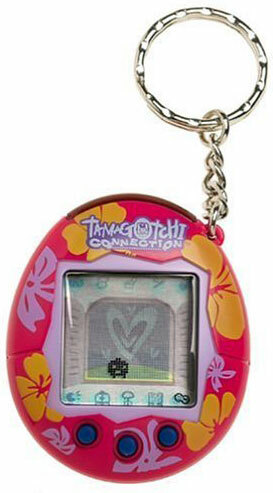 Caring for Tamagotchi helps it progress to adulthood. Ignoring it causes it to fly away.